Scrum is a simple framework that supports people in making the most of complex challenges. Organizations are re-discovering the sophisticated simplicity of Scrum. The third Scrum Wave is rising. Will you sink? Swim? Or will you surf? Shape the wave, shape the future? The Technology Adoption Lifecycle (TALC) describes the adoption stages of technology products or services, disruptions and discontinuities in hi-tech innovation. The TALC was created by Geoffrey Moore as an expanded version of the adoption cycle of more traditional products and product lines. 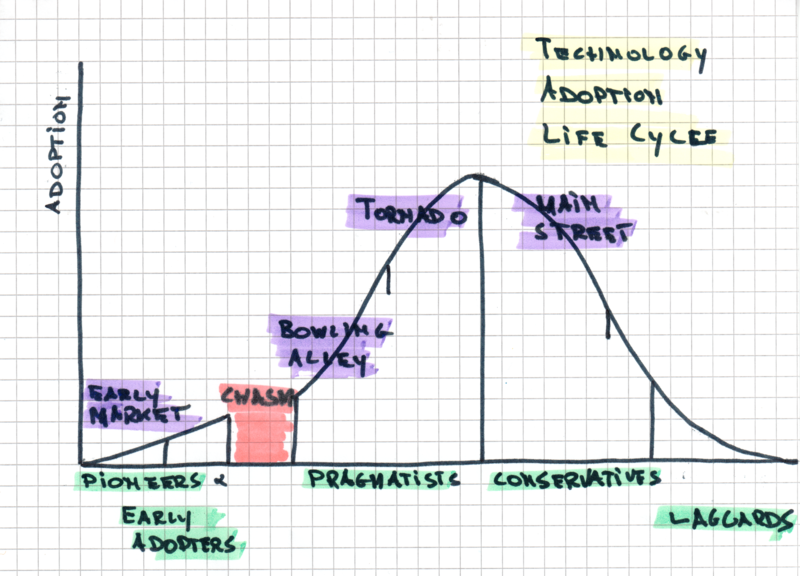 Every stage has typical adopter types. Moore added a “Chasm” period after the phase of Early Market. It is a period of stagnation, a period where adoption stalls. Some unknown time passes by before the next phase of adoption is entered, the Bowling Alley. The Chasm is unpredictable in length, but also in outcome. Some products never get out of this stand-still and simply disappear. The term ‘Agile’ became part of the software development lingo in 2001 with the publication of the Agile Manifesto. Before that time, it was just a plain English word that -in short- is synonymous to ‘adaptive’. In a way, it still is. New technological products that follow the Technology Adoption Lifecycle could be developed applying Agile techniques and principles. Agile in itself however is also a new, and clearly disruptive, game on the technology market and is therefore subject to the Technology Adoption Lifecycle as well. 2001 marks the start of the Early Market phase. At this stage Agile was mainly recognized and promoted for its potential value by early adopters; pioneers, visionaries, enthusiasts, innovators. Early adopters included individuals, teams and organizations. During the preceding ‘avant la lettre’ phase several approaches and techniques that later became ‘Agile’ were being explored by various ‘creators’. Important milestones are 1995 and 1996, the genesis of Scrum and eXtreme Programming. They were 2 well-defined new approaches to software development in which many of the core ideas of what became ‘Agile’ can already be discerned. A much broader audience discovered Agile as from 2005-2006. For many organizations the traditional way of working, the industrial paradigm, had been stretched far beyond its limits. There was nothing to stretch anymore. It created mental openness for a very different paradigm. Early Pragmatists discovered the advantages of the new paradigm, of ‘Agile’, and believed its problem-solving capabilities to exceed those of the existing ways. They were looking for solutions that might work. They had no need for widely documented evidence, but settled for the growing amount of anecdotal evidence. Agile crossed the chasm. 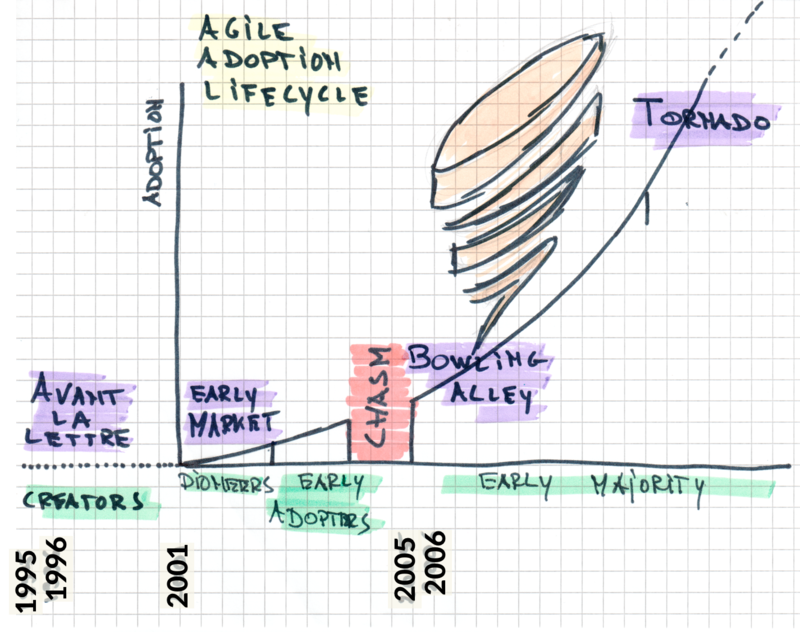 Although the TALC typically describes the succession of the Bowling Alley and Tornado adoption phases, the post-Chasm years of Agile primarily showed many back-and-forth movements. There was a lot of pull-back from the traditional, industrial paradigm. Still, a viable market formed. It is probably too soon to distinguish the Bowling Alley from the Tornado yet. I mainly observe a strong whirlwind that Agile goes through. 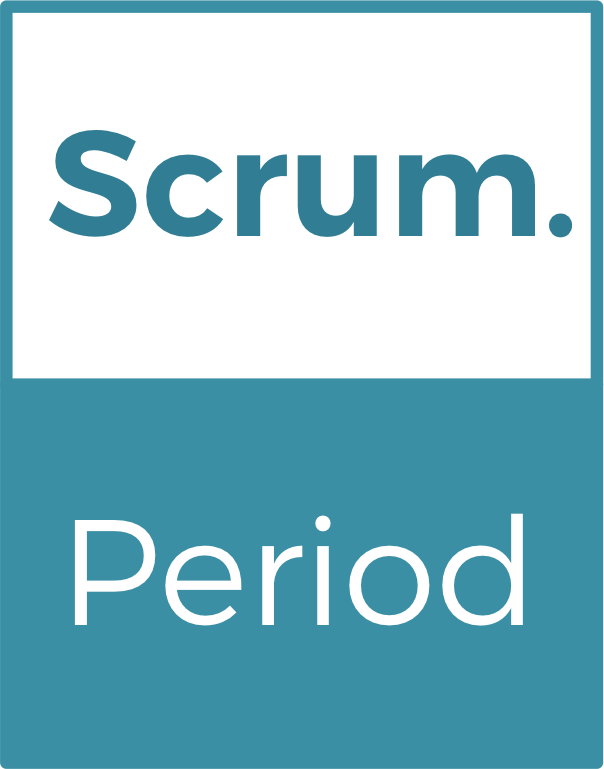 Regardless the inability to distinguish the transition from Bowling Alley into Tornado at the current point in history already, Scrum has been the dominant definition of Agile post-Chasm. Scrum is the gorilla that emerged. Inside of the whirlwind, three waves of Scrum have manifested. 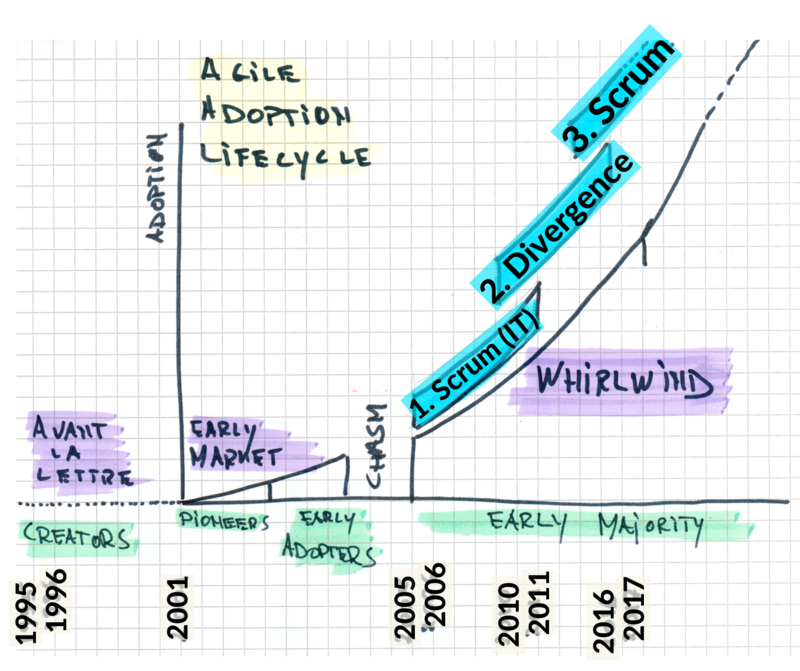 The first wave of Scrum, rising with Agile crossing the chasm in 2005-2006, was a reconnaissance wave for many. Organizations faced obvious problems in the IT and software delivery domain that could no longer be patched through the industrial ways. Scrum was adopted as the new IT development process. The second wave of Scrum built on the first wave when in 2010-2011 large organizations -often in the aftermath of the financial crisis- discovered they were at the end of the old ways of working too. In the slipstream of this ‘success’, sub-groups and derivative movements took off, new movements and methods were invented, introduced, launched, and often disbanded again. Divergence and scale were the ruling themes, on top of the common use of Scrum’s terminology and the shared desire to deliver working software in Sprints. 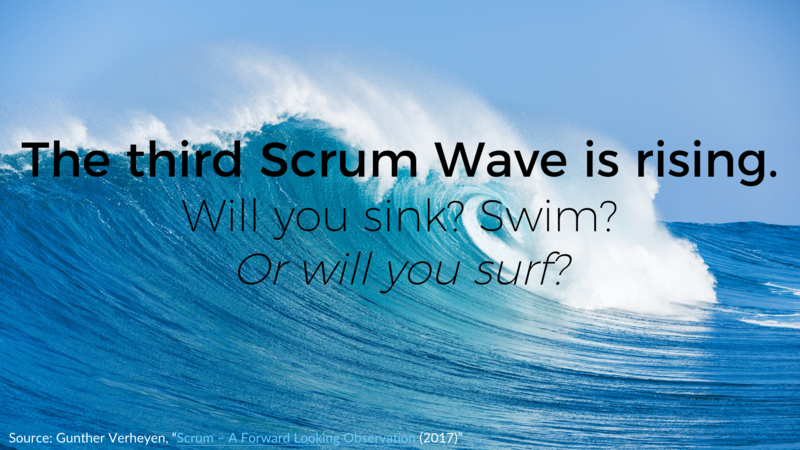 The third Scrum Wave (2016-2017) is fuelled by the desire, the drive for rhythm, focus and simplicity. Too much organizational waste, neglect of people and embedded complexity remain, fundamental impediments unresolved by the (often complex) solutions of the second wave. Organizations renew their acquaintance with Scrum. They appreciate that it is a well-defined and clearly stated framework that creates room for diversity, in it that Scrum can wrap a variety of strategies and techniques to be employed. Convergence appears on the horizon, where the rage of scattering, where the whirlwind might start calming down. Agile professionals worldwide sow seeds, and fertilize the grounds for many organizations to start bearing fruits, to start enacting Scrum. Join the bigger movement.